Big Monsters! Big Robots! Japan Loves It! Threequels dominate Japan's video game sales charts this week with the latest Monster Hunter, the latest Gundam game and the latest soccer RPG from Professor Layton game makers Level 5 sitting atop the list of newest bestsellers. Nothing could dethrone current champ Monster Hunter Portable 3rd for the PSP, which moved another half-million copies to secure first place on the Media Create list this week. 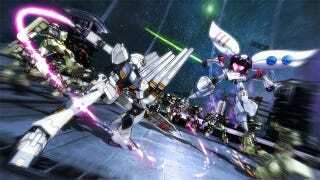 Gundam Musou 3 (pictured) for the PS3 and Inazuma Eleven 3: Sekai e no Chousen! The Ogre for the Nintendo DS came closest, but not nearly close enough. Other new additions to the list include Sega's Shining Hearts for the PSP, which debuted in the top ten, and the Japanese release of Castlevania: Lords of Shadow, which scared up enough sales to land at 17th place. Better luck next time, Belmonts. For the bestsellers on the software side for the week of December 13 to 19, read on. On the hardware side, the PSP continues its streak as the top performing platform, thanks to still awesome Monster Hunter sales. The Wii and DS give Sony a run for its yen this week, giving Nintendo the edge in overall sales.